It’s Memorial Day. Do You Know Where Your Garden Is? This is of course the traditional day to put in tender crops in the north. 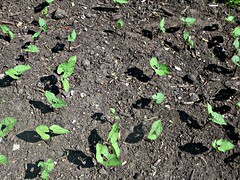 Despite a cold wet spring, we were able to put in beans and other tender seeds two weeks ago. Lisa insisted that we not plant the tomatoes and peppers until the soil warmed up, but that happened this week when we moved directly from mud time to summer, with literally hours of spring. The Republican party has switched from claiming that global warming is not man made, to claiming that global warming is not happening. My growing season is a solid month longer than it was 20 years ago, and that’s with the coldest winter in a decade. We’re doing quite well on planting this year, despite it being too wet to even prepare beds for most of month. The tomatoes went in today, leaving the sweet corn as the only remaining time-critical crop. That is going into a new area of the garden, which means I need to build it beds first. I’m taking a tip from Eliot Coleman and starting corn seeds in plug trays to buy us an extra week or so. The watermelon is sprouting in a plug tray right now, to go out when it gets vaguely established. I might just as well have waited the extra week and seeded straight into the ground now. The winter storage crops still have to go in of course, but I have until the 4th of July for most, and till August 1 for the carrots. We built a lot of new beds last year, this year I’m just topping them up with compost. It makes a big difference. Speaking of beds, we made a mistake when we built them only a foot apart. We got that idea from Eliot Coleman too, and it did save a bunch of space that we are short of. However, we missed the fact that his beds are temporary, mounded up by the tractor every planting, after he spreads the soil amendments. Ours are permanent, the wood lasts 10-12 years, and we can’t get a wheelbarrow between them, reducing me to 5 gallon buckets, which is painfully slow. We’ll just be a little less space efficient from now on. We had a massive flush of Aspen Oyster mushrooms (Pleurotus poppulinus) on three different dead popple trees this week. We’ve never had them before, but I’m now wondering about inoculating some logs. Fresh ‘shrooms in May are a big win. Few others are ready until July around here. I also got a quick look at the bees last week, cut short by a shower that wasn’t supposed to happen. The original hive is thriving. I’m thinking of splitting it again, because I think it’s still planning to swarm. I need to take a better look for swarm cells. If I find some, I’ll try using them for another split. In the mean time, I added a honey super. The split shows a lot less activity, but there were a decent number of bees and a queen cell when I went inside. They had honey left from the deadout, and were laying down more, so I gave them a super as well. The package down here was just as nasty as the one up on pitcher mountain. I didn’t get a chance to look for brood. It started to rain, so after letting them get wet enough to not try to kill me anymore, I slapped on the second hive body and got out of there. Hopefully I’ll get back in to the two I didn’t finish with this week. We had the first hatch from the cabinet incubator. 29 out of 73 eggs hatched, over a period of 5 days. Neither is a good result. I’m hoping it was because I used too many old eggs. We have duck and turkey eggs as well as a second tray of chicken eggs that should hatch this week. This second set of chicken eggs went in fresh. Hopefully that will fix things. 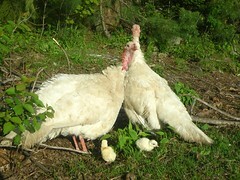 The turkeys are also beginning to hatch. The big white dogs seem to be earning their kibble, the hens are surviving nesting in the woods. We’re getting a very poor hatch rate here too, though. It looks like Randy and Dandy were too overworked this spring. The poor lads certainly looked it, and we’re getting three to six instead of eight poults per clutch. Next year we’ll try 10 hens per tom instead of 15. 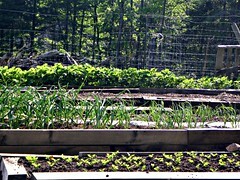 This entry was posted in Carrots, Design Ideas, Hatching, Honey Bees, oyster, Peppers, Planting, Politics, Seed Starting, Tomatoes, Vegetables. Bookmark the permalink. Post a comment or leave a trackback: Trackback URL. Frank, don’t you just love this time of the year? Everything is coming into new life. The garden seeds are starting to sprout and grow. The birds are starting to hatch their clutches. Sounds like the hatch isn’t doing too well this year but still there is increase and new life that has come to be. I am enjoying the time outside in the yard and garden. I don’t have flocks or dogs nor do I have any other animals but I do have entertainment from the wild life in the neighborhood. It comes from birds, rabbits, squirrels, and neighbor’s dogs. Have a great hatching day.